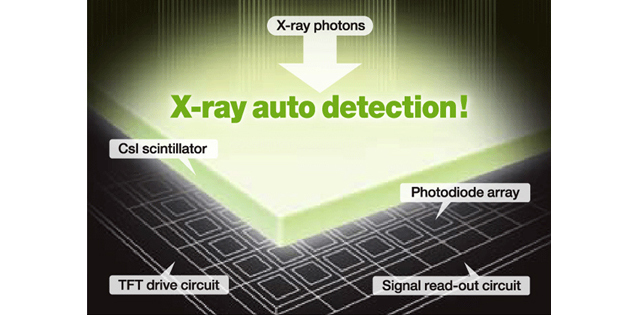 The AeroSync technology is equipped with an X-ray auto detect mode in which the panel automatically detects X-ray exposure. The AeroSync enabled panel automatically senses an X-ray exposure, automatically forms an image, and transitions to the X-ray storage process, communication with the X-ray generator is no longer necessary. This means that using AeroSync, even analog portable X-ray systems not fitted with digital radiography, or “DR” interfaces can be easily upgraded into digital systems. Due to AeroDR’s wireless communication and AeroSync technologies, the AeroDR portable upgrade system (panel, console and wireless access point ) can connect to almost any portable system and is easily shared between multiple units.